So it’s memoir month around my house, apparently. This is what happens when you are cheap and mostly check out books from the library. All of my Library Holds showed up at once, they were all memoirs and it doesn’t really matter if I am in the mood to read them or not. For the record: I’m not really at this moment, but I am making due. My life of first world problems is so difficult, let us all have a moment of silence. Currently, I’m reading Talking With My Mouth Full by Gail Simmons, who is not only a Top Chef judge, but a Food & Wine Magazine aficianado and clearly Padma Lakshmi’s Terrible Outfit enabler. A complex woman, obviously. I’m also reading the Jaycee Dugard memoir A Stolen Life, but you don’t really want to know about the thoughts I’m having while reading that book, so let’s just get back to Gail. I was actually very excited to get my filthy mitts on this book because I have super pink puffy heart LOVE for Top Chef. (Really anything on Bravo, but I think we already discussed that.) Anyway, I was curious about Gail and her career trajectory and how she ended up with this offbeat career, and so I was excited to see how it all played out. And then I opened the book and all my thoughts started flooding. 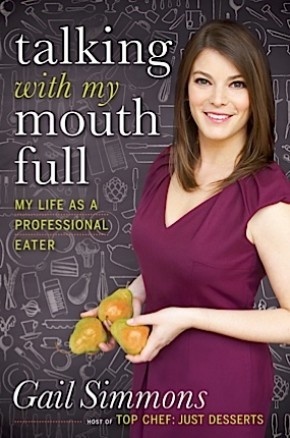 Thought # 1: Wait — wasn’t Gail Simmons a Food Writer at one point? While I won’t say this is the worst book I’ve ever read (it’s totally not!) the beginning was just…not very compelling. Especially when she talked about food. There was one passage where she wrote about her time working in Daniel Boulud’s kitchen (Daniel Boulud! The cuisine he cooks probably deserves many adjectives!) and it read something something like “The blackberry cobbler was purple. Also tart. The seeds got in my teeth.” Short choppy sentences, lots of telling, not showing. Very little description. Stark contrast to other food memoirs that I’ve read. I mean, I’ve read Ruth Reichl passages that made me need someone to bring my inner-hedonist a towel to mop up my drool, you know? Thought # 2: Jeffrey Steingarten is a total weirdo. And yet I would TOTALLY work for him if I ever had the opportunity! I mean you guys, when Gail worked for him all she did was shop, cook and eat. This is my ideal job description. Sure it sounds like she was doing that amazing job in a dark apartment that smelled like goose-fat with a condescending, chocoholic ogre who has a very refined palate but a very UN-refined set of social skills, but still: How do I get a job where this is all I do. I could get used to smelling like goose fat. I think. I mean, how can it not? Check out how fun it looks! Here is the thing, I love my Paleo eating, but I would happily slurp a plate of spaghetti with Mario Batali. I mean COME ON! The book finally gets good when she starts talking about it, and her description of it made me want to go IMMEDIATELY. That was my sly way of saying the writing has improved slightly. Did you get that? Ok good. It’s an entire weekend full of eating and drinking in excess! Watching cooking demonstrations and taking classes about grape varietals! Schmoozing with famous chefs! Once in a lifetime experiences! Fabulous people and fabulous weather! Oh and did I mention eating and drinking in excess? And all for the bargain price of $1125. Per Person. HAHAHAHAHAHAHA…sob! I’ve started reading the blog just to torture myself. Anyway, I’m almost done with it and it’s not the best memoir I’ve ever read, but it moves fairly fast and she’s starting to dish on the Top Chef contestants/meals so you know I’ve gotta get in on that action! Uh, not to be…rude? But is it just me or is that picture of her on the cover super photo shopped? Super photo-shopped! haha Also, awkward pose, right? Something about the way she is holding the pears just screams awkwardfamilyphotos.com to me. I’ve been wanting to read this book and your insights are quite helpful, Holly. Gotta say, I’m totally in the same position as you on the library books front right now — curses having 4 books come in at the same time and having only 3 weeks to read ALL of them AND do all my other hobbies. Life is tough in America these days. I’ve heard similar reviews of her book that hte writing is stilted and was surprised, because like you said, her background is as a writer! How can she not write better? Was her book not edited properly? Either way, I’m still going to read it, but I’m glad to know what I’m in for. Don’t get me started on the pears — she has a glint in her eye that says she’s holding the family jewels in her hands and could crush them at any time. HA!!!!!!! I actually just snorted reading that. Total family-jewel crushing smirk! Good luck getting all of your books read. Story of my life these days! I was thinking of buying the book, but I’m #18 in line for it at the library, so I’ll just wait. I’m ridiculously excited for the Top Chef gossip. I’m definitely going to read this, just because I LOVE Top Chef. I was hoping it would be better, though!